← Baby Shower Bouquet – Cricut Roses and More! This is one of the gifts for a stocking swap that is wrapping up with the grand reveal in a few hours. My partner enjoys baking so I thought she might enjoy something easy and fun like a cookie mix in a jar. 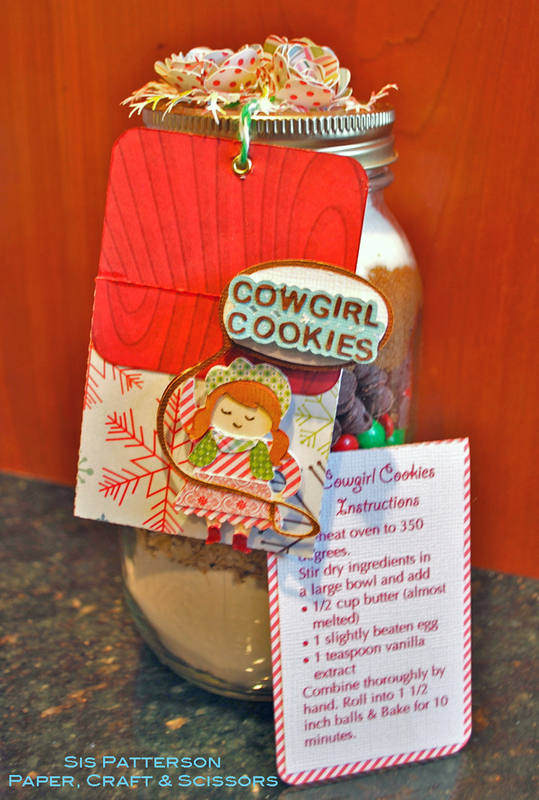 I found the recipe for Cow Girl Cookies from the wonderful Bakerella. And while I originally intended to use pink M&Ms, at the end of the day, I needed to go with the Christmas red and green color scheme. This project uses Cricut’s Yee Haw cartridge for the cow girl with her lasso. She is cut at 3″ tall. I used a mix of 6″ papers to create her Christmas outfit and Copics to color her boots, hair, and skin tone. I used a Micron pen to add her facial features. Because the cut is so small and the rope so fragile, I used Cricut Craft Room to add some stability to the title. The basic cow girl cut includes the lasso with a center hole. If you use Copics or another medium to color the skin tone of your cow girl, using CCR, you can simply hide the inner contour in the lasso so that the lasso has a solid center and cut it white card stock. This will give you a white word bubble. If you are not coloring your cow girl, you can still use CCR to fill in the bubble on the lasso cut and cut it in white (or whatever color you wish) for the word bubble. Next, cut the lasso (with the hole in the center) in brown and adhere on top of the previous lasso cut. I used my Silhouette Cameo to make the Lori Whitlock pocket card tag and printed the assembly and baking directions on a separate sheet of paper that I adhered to the back of the tag. The letters and the blue offset are from the Silhouette Cameo as well courtesy of the Studio Designer Edition software. The brown letters measure .25″ tall. I used Cricut Artiste to create the paper roses on the top of the jar and the McGill pine branch punch to add the texture. If you are looking for a quick and easy gift this Christmas, you may wish to check out a cookie mix recipe and get your die cutter(s) working. This is precious!! 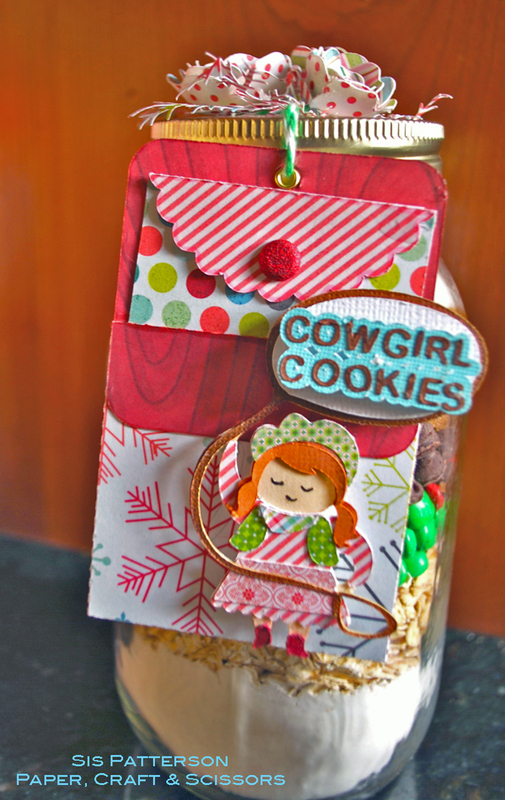 I love the flowers on the lid and how her printed cowgirl duds are coordinated Christmas-y prints! As always with recipe pages, you have picked a perfect image to illustrate the recipe— all the way down to the lasso! Brilliant!! I know your swap partner will be thrilled to open this! Thoughtful, practical, fun, and beautiful! What a great little gift! LOVE all the details on the tag (you’re so good at the details!!) & I checked out the recipe a little bit…it sounds simple enough that I might even give it a try! Thanks for sharing, AND for the inspiration!!! This just wonderful!! Not only is your little cowgirl adorable, but I love the bright, happy flowers on the lid. Great colors and a fabulous gift idea! This is just as cute as can be! I love all the detail! Thank you for sharing this super little tag! How adorable! She’s a mini work of art! I love the tag and the details of your work. What a wonderful happy work of art. I am ready to try the recipe thanks for sharing Bakerella website. This tag is terrific! The cow girl is too cute! I really love the lid, what a nice bright touch! Love it!